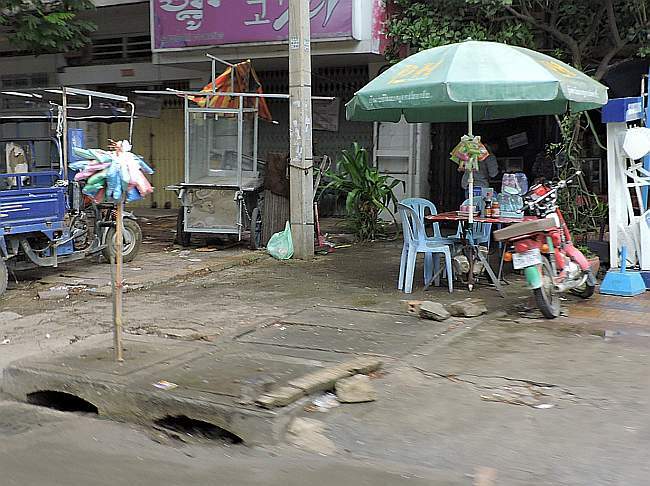 Charles Dittmeier – Page 90 – Welcome to Cambodia, and…..
Here’s more–Part 3–about the blue plastic strips used to protect new cars–and old cars in Cambodia. Click here to see what one car dealer said he had never seen anywhere else in the world. Scroll down to Part 3. Last night I was at an Advent reconciliation service and I got a call from the DDP co-director who told me that the wiring on the pole across the street from the Deaf Development Programme was burning. This morning there was no electricity or Internet service because of the fire on the pole. But much to my surprise, the electricity company came this morning and repaired the wires. I honestly thought it might be a week before they came, given the way things work in the Kingdom of Wonder. Another surprise was seeing them using a truck with a power lift. Always before it’s a couple guys hauling big ladders around on a motorcycle. Maybe some things are changing here. Notice the remaining wiring under the street light is all white. That is the fire retardant powder sprayed from four of the DDP fire extinguishers and four from the apartment building in the background. You don’t call the fire department in Cambodia. It would take them forever and then you would have to pay them before they fight the fire. But now we’ll have to pay to refill our fire extinguishers. Most of Cambodia is flat as a pancake but there are a few areas with some different topography. This morning, coming back from Kep Province in the south, we went through an area with a few of these little hills (we would call them “knobs” in Kentucky). We passed through them for a space of five or ten miles and then all was flat again. 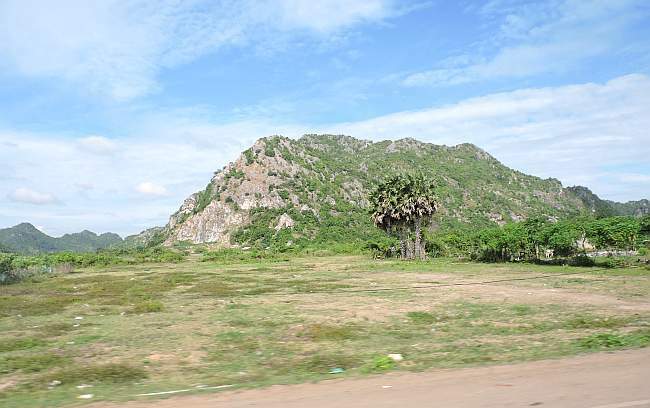 They may be part of a small range of “mountains” near the southern coast on the Gulf of Thailand. The hills there are small in extent and also in height. The highest peak in Cambodia is about 3,000 feet. Today was the actual day for the wedding in Kep. Click here for the Monday goings-on. Scroll down to Monday. 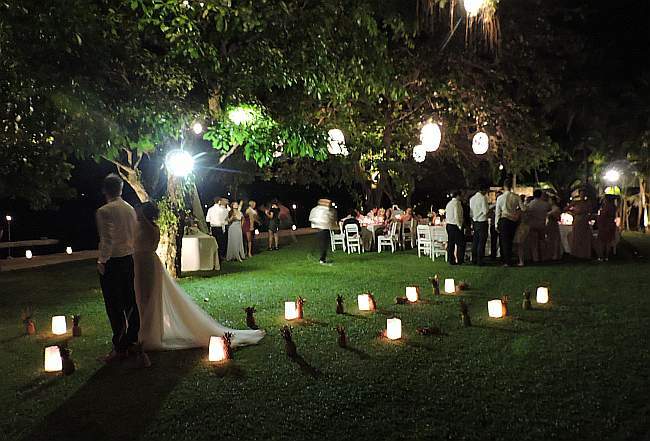 This weekend I had a wedding in the coastal town of Kep. 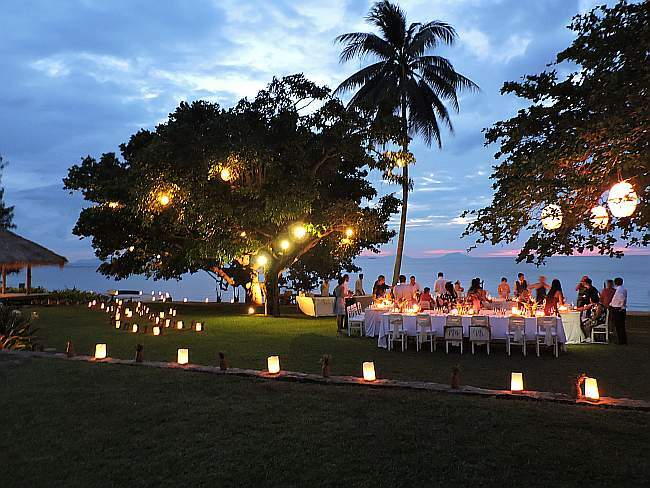 It’s unusual because the wedding took place on a hotel beach front. Normally church rules allow weddings only in church buildings but because there is no church in Kep (the nearest parish church is 35 km away), the bishop allowed this wedding outside. The bride was born in Burma and her family now lives in California. The groom is from Canada. 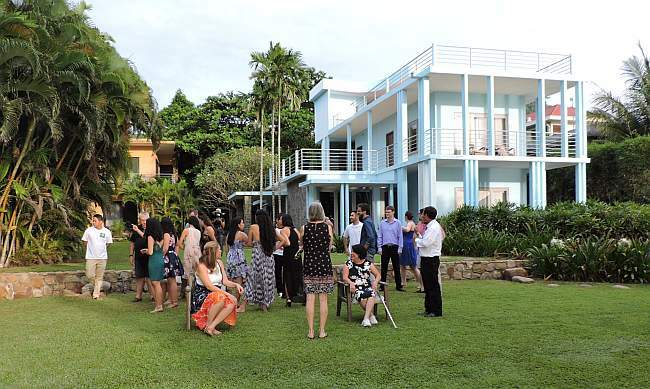 Both of them work now in Cambodia and wanted their families and friends to have an opportunity to see some of Cambodia’s beauty as well as attend the wedding. This afternoon we gathered on the hotel lawn for a rehearsal for the ceremony to take place tomorrow. 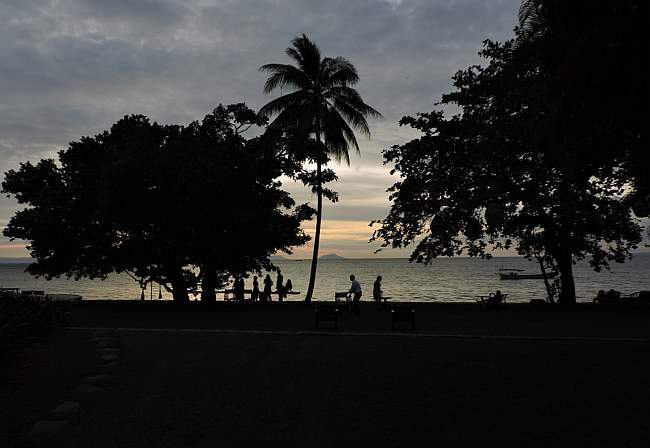 After the rehearsal some of the wedding party lingered on the beachfront as the sun set. The wedding was at 2:30 PM so I was free in the morning. One task I had was to pick up the marriage registry, the book where the marriage records are kept. It is kept in the parish church in Kampot and I really didn’t want to ride 35 kilometers there to get if I didn’t have to. Luckily, the pastor there was able to arrange for someone to drop it off at the Don Bosco School in Kep yesterday and I went to the school this morning to get it. 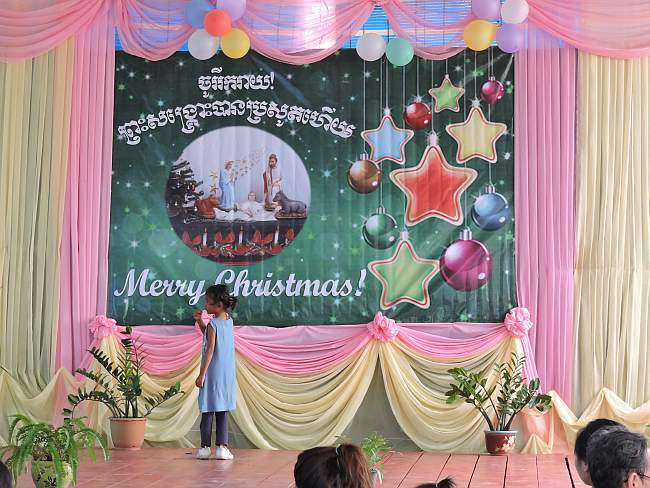 This picture is of some of the students there preparing Philippines-style Christmas decorations. 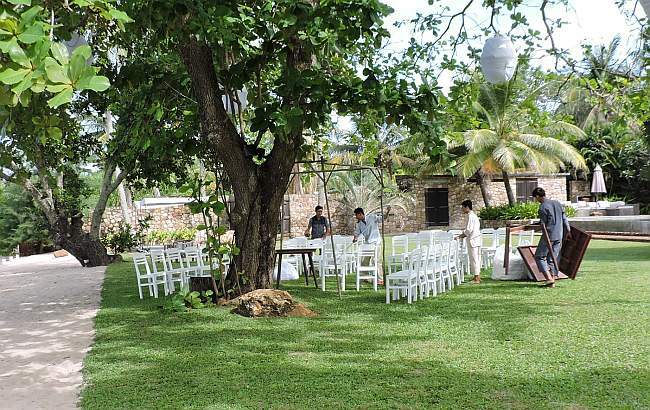 Setting up chairs and an altar for the wedding ceremony. Preparing for dinner after the ceremony. The bride and groom going to the pavilion for serving the cake. 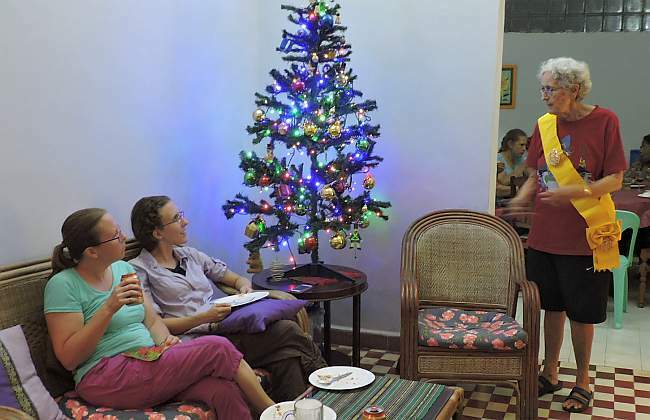 One of the traditions of the Maryknoll community in Cambodia is gathering each year to set up the Christmas decorations at the Maryknoll Sisters’ house. This year it happened on Friday, 16 December. Usually some of the first-comers start decorating Christmas cookies. L-R: James Havey, Sami Scott, Bob Wynne, and Olga Pacumbaba. 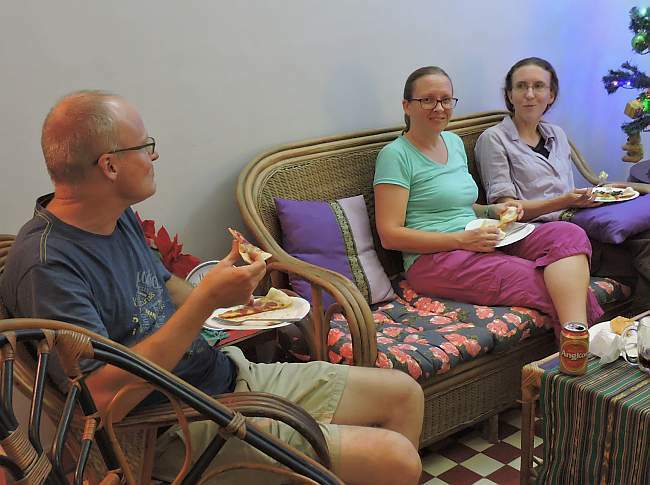 Eating pizza in the front room are Charles McCarthy, Mara Rutten, and Karen Bortvedt. 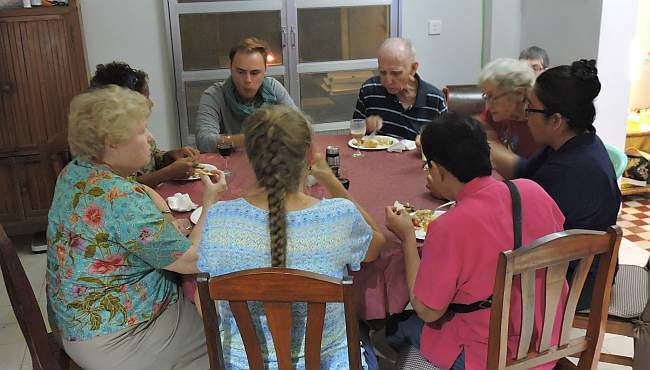 Eating in the dining room are (Clockwise): Helen O’Sullivan (green blouse), Dee Dungy, James Havey, Bob Wynne, Luise Ahrens, Len Montiel, and Olga Pacumbaba, with Ann Sherman hidden in the corner. Sr. Luise Ahrens showed Mara Rutten and Karen Bortvedt the sash that came with being honored by the government for her many years of service to the Royal University of Phnom Penh. Then it was time for Christmas carols. L-R: Sami Scott with the flute, Mara Rutten with the guitar, Luise Ahrens, Ann Sherman, Bob Wynne, Russ Brine, Kevin Conroy, and Mary Little. 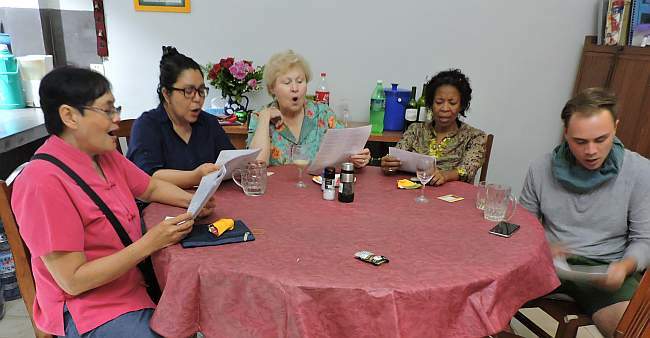 Singing in the dining room are Olga Pacumbaba, Len Montiel, Helene O’Sullivan, Dee Dungy, and James Havey. At the other end of the living room: Kevin Conroy, Mary Little, Karen Bortvedt, Sami Scott, and Mara Rutten. 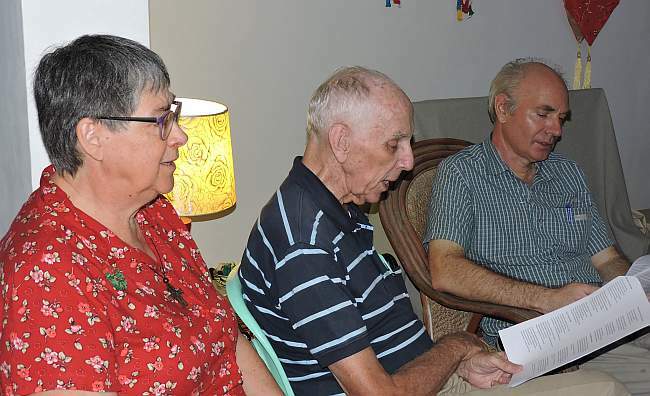 Adding to the Christmas spirit with their singing are: Ann Sherman, Bob Wynne, and Russ Brine, our newest addition to the Maryknoll Cambodia Mission Team. Missing tonight was Maria Montello who is in the United States. One of the worst aspects of deafness is isolation, not being part of all that is going on around you, even in your own family. 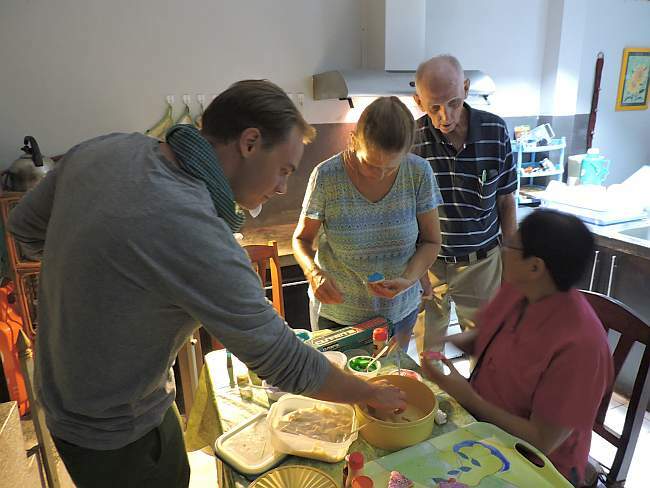 That creates great interest among deaf people for getting together whenever they can. 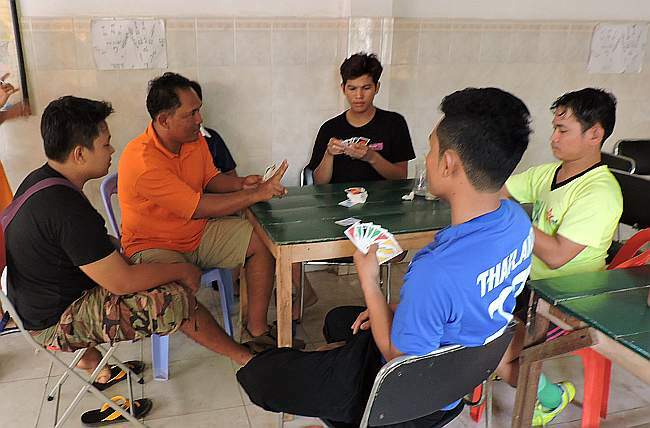 The Maryknoll Deaf Development Programme has a Deaf Community Center (DCC) in Phnom Penh and in Kampot and Kampong Cham Provinces and they are open on Saturday and Sunday for deaf people to drop in and play games or participate in various activities. This group is playing dominoes. Inside the center this group is playing Uno. 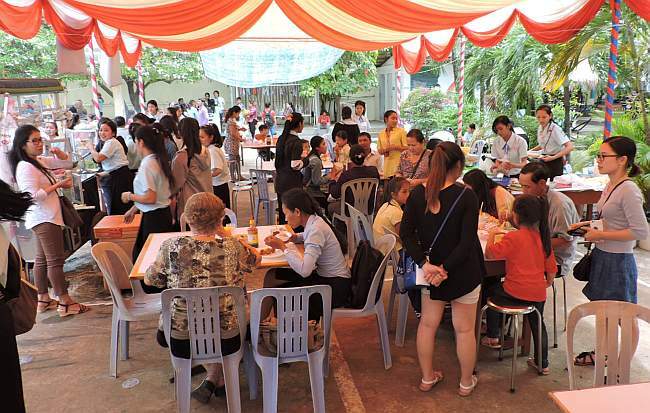 The Salesian Vocational Training Center for Girls in Phnom Penh has an annual Christmas Bazaar. It is partly a fund-raising activity and partly an opportunity for the young women to plan and put together a group project. 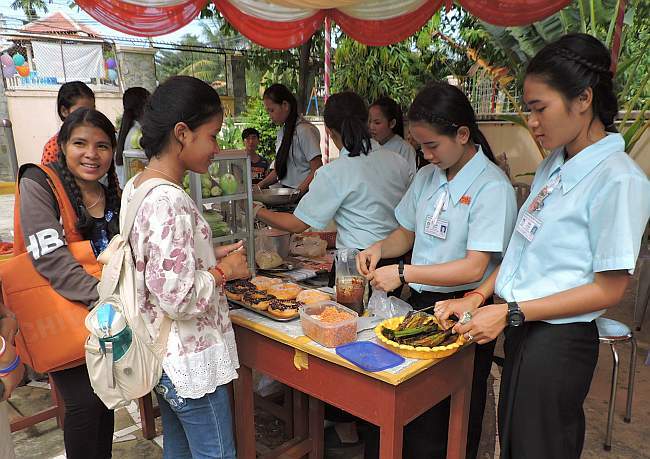 These young women are offering one of the many food selections available at the stalls set up in the school’s courtyard. 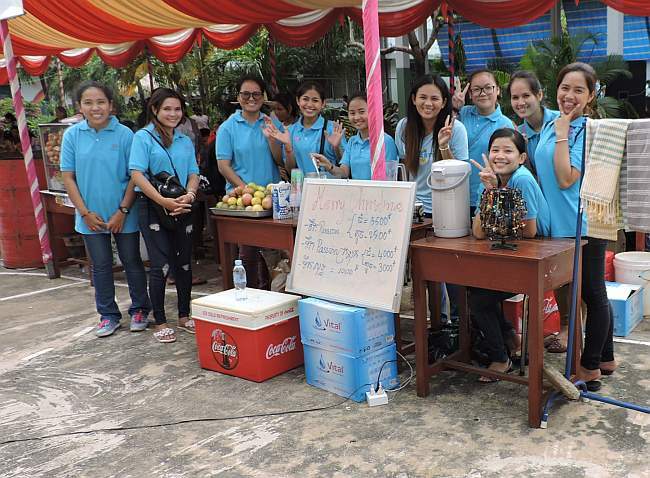 These girls were making all kinds of fruit drinks. 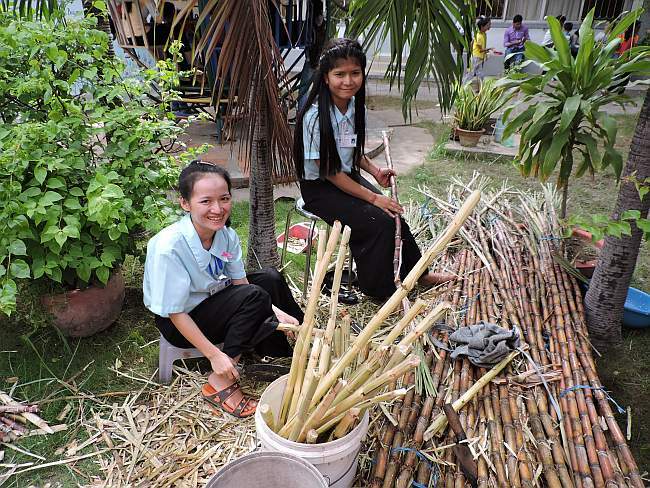 Sugar cane juice is a very popular drink Cambodia but someone has to scrape the bark off the canes. Here is the dining area where people go after visiting the different food stalls. This little girl is waiting for the afternoon performance to begin. Climate change may be a matter of debate in some circles but not in Cambodia. When I first came almost seventeen years ago, it was common wisdom that the rainy season started in May and ended at the end of September or early October. Then a few years ago I noticed it seemed to be raining later, even into late October and November. This year it’s still raining today, 14 December. 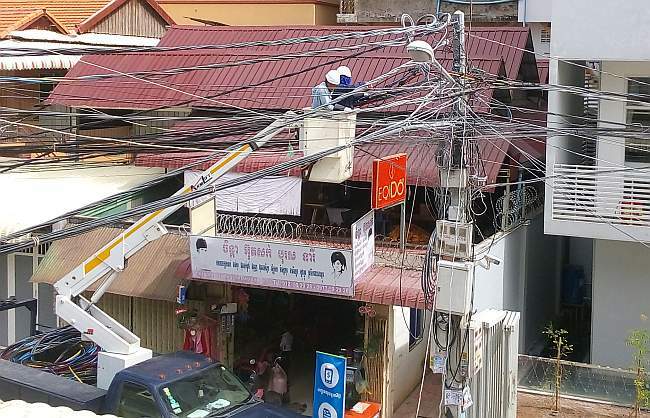 Cambodian people are not known for critical thinking and planning ahead. 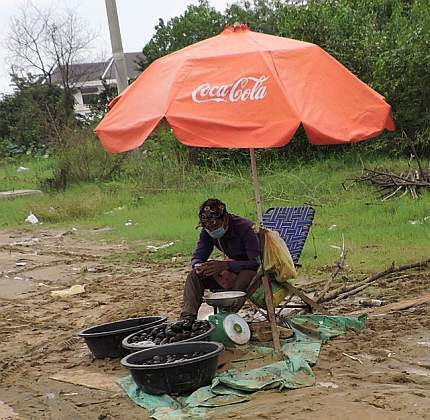 Even in the rainy season, when it’s almost certain that it’s going to rain, many people are out without a raincoat. Some forget them. Many just can’t be bothered or figure the rain will stop before they leave work. 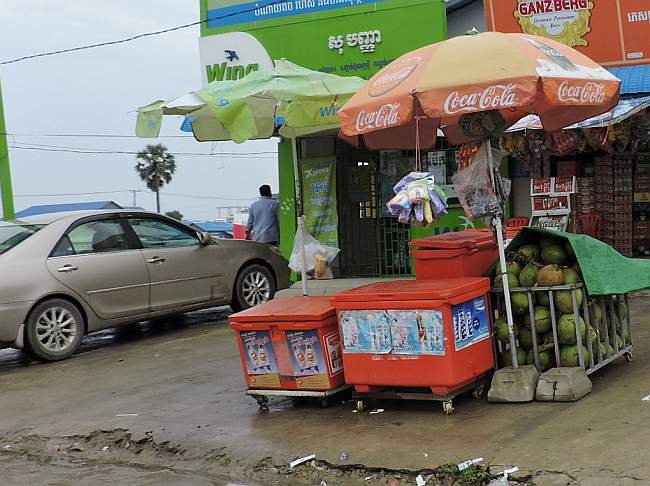 For those who get caught, cheap disposable plastic raincoats (the multicolored packages in the upper right of the photo above) are available for about 35¢. 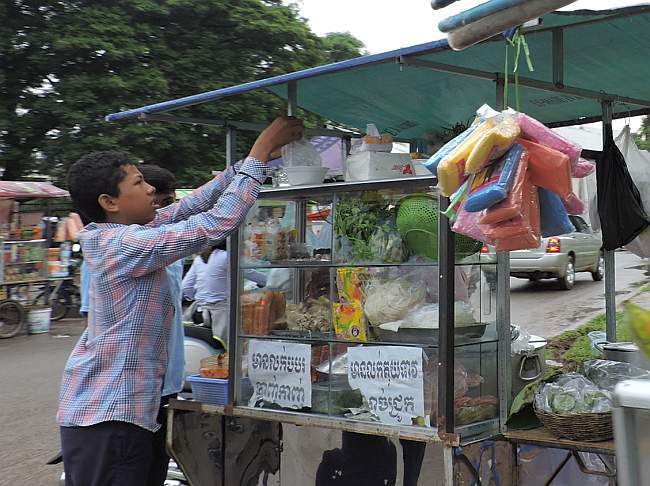 This mobile hawker of food has some available on his cart, and the gathering of clouds brings out numerous offerings of the raincoats stuck on poles, hung from overhangs, canopies, etc., in many of the shops along most streets. I have mentioned before that when the weather is always the same, it’s hard to keep track of the seasons without external markers like sports seasons, etc. 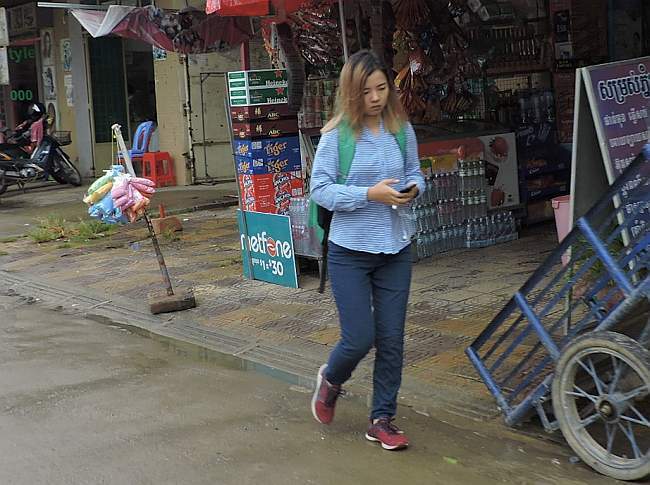 One help to identifying seasons in Cambodia is to notice what fruits are being sold on the streets. Some only bloom at certain times of the year. Today I passed quite a few people selling these black round fruits, here sitting in tubs of water. They look like mangosteens but these are black. I have no idea what they are.